Your garage door springs are placed under a lot of tension every time you open or close your garage door. If one of these springs is damaged, or if one or more of them wears out, you could be facing a serious safety hazard for yourself and your family. At the very least, a failed spring could mean that you can no longer open or close your garage door, either with the garage opener or manually. At the worst, your garage door could come crashing down on your car or on one of your family members. To avoid either of these situations, at Garage Door Pro, we recommend scheduling regular garage door maintenance with us at least once a year to ensure that your garage door is in perfect working condition and that you aren’t in need of any garage door spring repair or any other repairs or replacements. Even if you have us regularly maintain your garage door, emergencies and damage may happen, due to extreme weather, accidents, or other damage to your garage door springs. If this happens, don't hesitate to call Garage Door Pro. At Garage Door Pro, we offer 24-hour, same-day service. 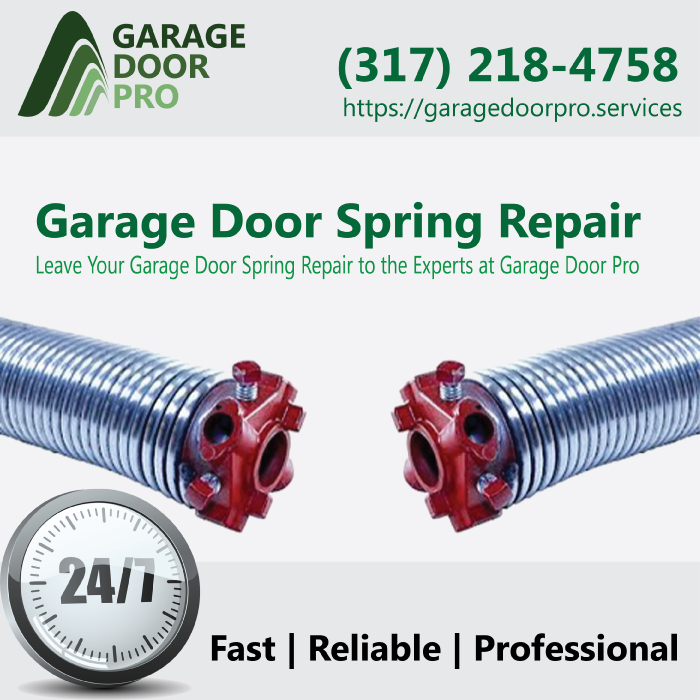 If you need garage door spring repair services at any time of the day or night, you can call us and we will send out one of our experienced technicians to find out what the problem is and to take care of it as quickly as possible for you. Whether you need garage door spring repair, regular garage door maintenance, or you’re considering purchasing a new garage door for installation, call us at Garage Door Pro today. We will be happy to discuss all of your options with you and help you find the best solution for your garage door needs. Want to learn more about our garage door springs repair services?